Typical name tablet mosaics of the Dual Contracts era at Christopher Street/Sheridan Square on the IRT West Side Line. Photo by David Pirmann, March 2009. 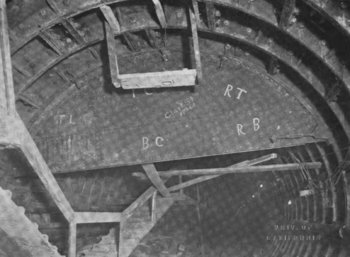 The IRT line on the West Side of Manhattan comprises portions of several different subway construction contracts, including the 1904 Contract I "First Subway" from north of Times Square and several extensions to it, and sixteen 1915-1918 Contract III, or "Dual Contracts" stations. The Contract I and Dual Contracts construction is covered in-depth elsewhere on this site (The First Subway, and The Dual Contracts), so this overview will consist of a few brief notes. Service opened in stages, with opening dates identified on each station's description page, but to summarize: October 27, 1904, Times Square - 145th Street, with the rest of the northward part of the line to Van Cortlandt Park opening by 1907; June 3, 1917, shuttle service began between the new Times Square 7th Avenue Subway station and 34th Street/Pennsylvania Station; July 1, 1918, South Ferry to Times Square, plus shuttle service between Wall Street and Chambers Street; August 1, 1918, through service from South Ferry to Van Cortlandt Park; April 15, 1919, service to Atlantic Avenue, Brooklyn, via the Clark Street tunnels which connected to the Wall Street station. Section 5A, Center of East 41st Street west and north to the center of West 47th Street and Broadway, a 0.82-mile length of four track subway. Stations were built at Grand Central (express) and Times Square (local) along 42nd Street (today's Shuttle operation). Work on this section commenced on February 25, 1901. 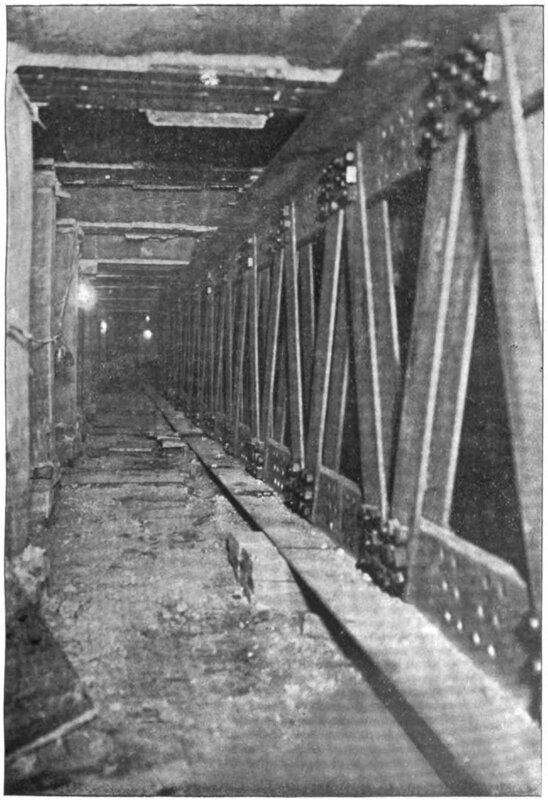 It was this section that was broken in 1918 when the "Dual Contracts" 7th Avenue Subway was tied into the Contract I subway at 7th Avenue and 42nd Street. A single track connection was retained for access to the northernmost of the Shuttle tracks, visible in today's Times Square shuttle station. Two articles describe the August 1, 1918 service changes that would become known as the "H System": IRT H System Opens (1918), and The H Lines In Service (1918). Section 5B, Center of West 47th Street north to the center of West 60th Street. 0.69 miles of four track cut and cover subway under Broadway. 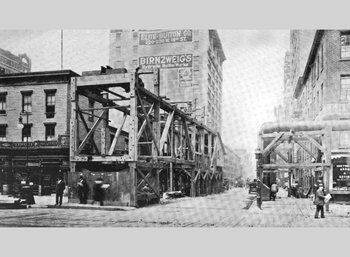 Stations at: 50th Street and 59th Street (Columbus Circle) Construction commenced September 19, 1900. 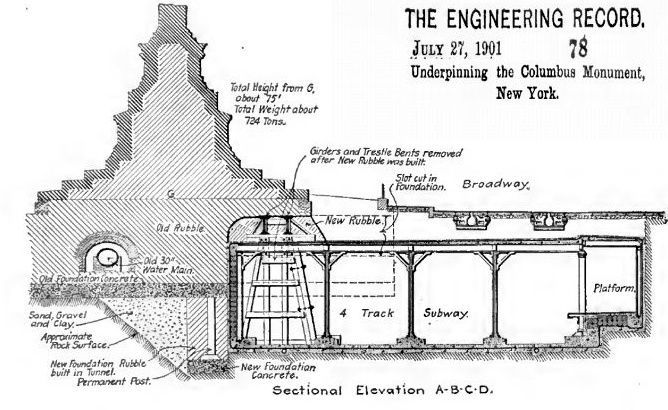 This section underpinned the Columbus statue at Columbus Circle, detailed in a 1902 article: Difficult Engineering in the Subway (1902). 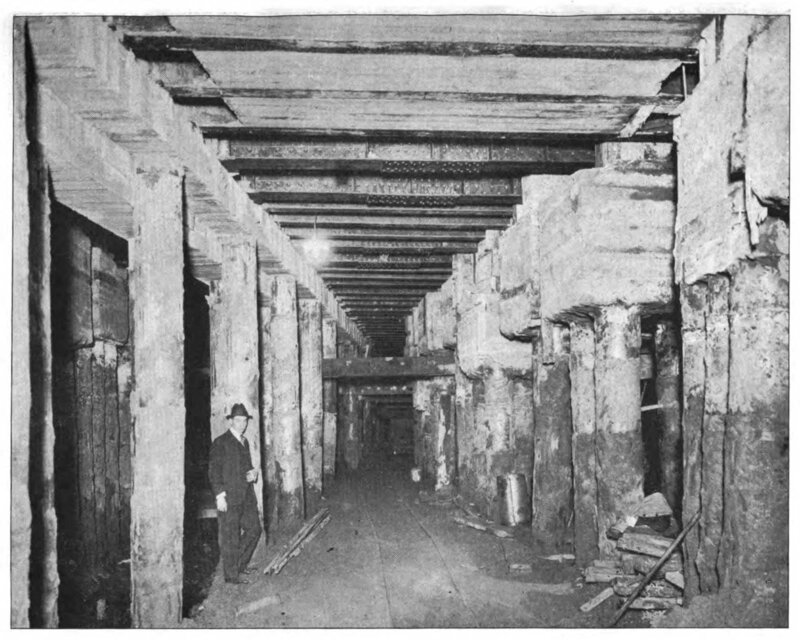 Section 6A, Center of 60th Street north under Broadway to the center of 82nd Street, 1.20 miles of four-track cut and cover subway. Stations at: 66th Street, 72nd Street (express), and 79th Street. Construction commenced August 22, 1900. Section 6B, Center of West 82nd Street 1.07 miles north under Broadway to the center of West 104th Street. This section included the junction of the "West Side" branch and the "East Side", or Lenox Avenue, branch north of 96th Street, as well as the stations at 91st Street (now closed), 96th Street (express), and 103rd Street. North of 96th Street the express tracks descend and turn eastward northward, becoming three tracks, to the station at 103rd Street. Some last minute design changes added the third track northbound, and a provision for a third track was also built into the lower level Lenox branch of the junction. This accounts for the extra space seen alongside the active tracks in this area. 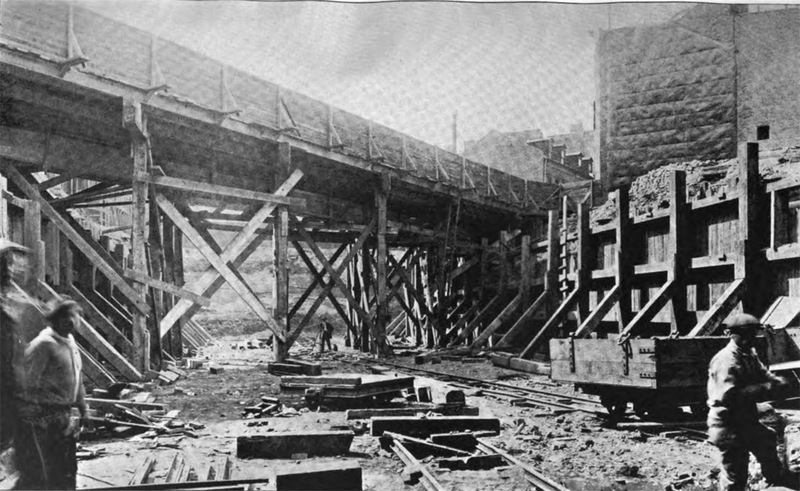 Construction of this section began on August 22, 1900. Service in this area was originally operated with some locals and some express trains entering both branches, causing a bottleneck at the crossovers at the junction. As early as 1908 improvement was sought in this area by planning extra flyunder tracks, which were never built. Better signalling was installed instead; but by the 1950s it was decided that all of the express trains would head toward Lenox Avenue and all of the local trains would continue north along Broadway, which remains the operating pattern today. Postcard: "Subway at Broadway and 98th Street showing East Side [Lenox] going under West Side branch, New York." 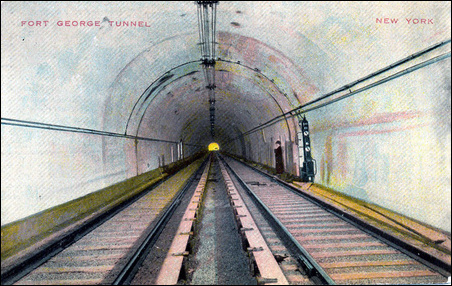 Postcard: The Fort George Tunnel. Section 7, a deep rock tunnel under Central Park from 103rd Street to 110th Street, 0.87 miles long. No stations, although one was planned for at Central Park West. Construction began October 2, 1900. Section 8, 110th Street to 135th Street, two track cut and cover subway, 1.28 miles long. Stations at: 110th Street (island platform), 116th Street, 125th Street, and 135th Street (all side platforms). 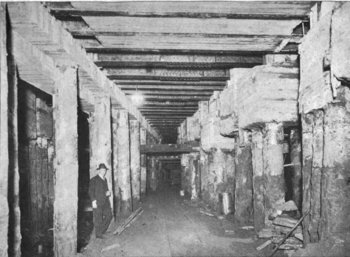 The subway runs under the west half of the wide Lenox Avenue, having been built here to avoid work under a two track street railway on the east half. The 135th Street station has a third center track intended for use for layups, but now mostly disused. Construction began August 30, 1900. Section 11, 104th Street north under Broadway for 1.07 miles to the portals near W. 122nd Street. 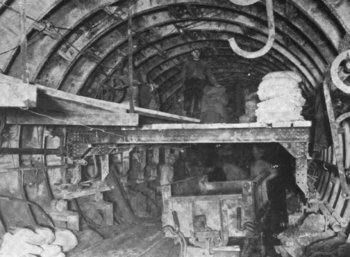 Three tracks of cut and cover subway, with a concrete arch roof north of 116th Street. Stations at: 110th Street (Cathedral Parkway), 116th Street (Columbia University). Construction began June 18, 1900. 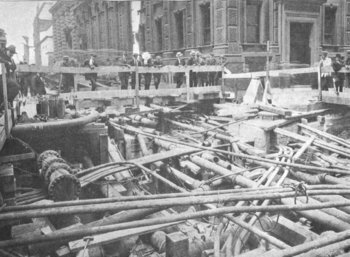 The third track was added after construction began, detailed in a 1902 article: Difficult Engineering in the Subway (1902). 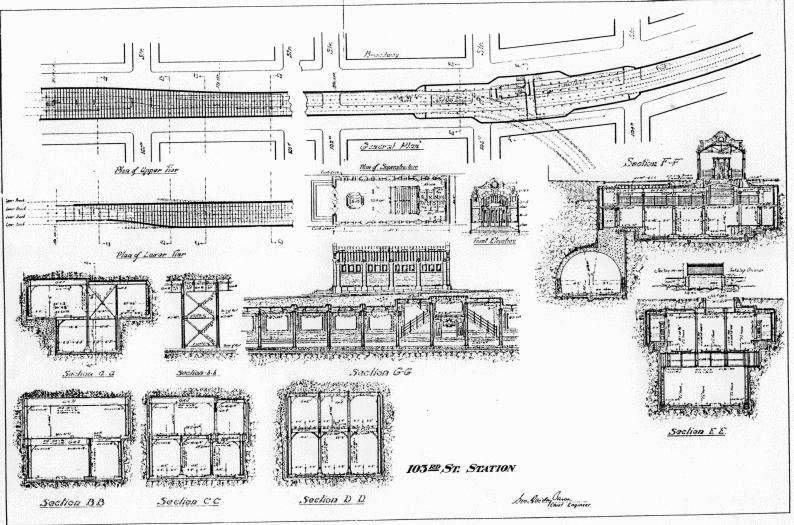 Section 12, Manhattan Valley Viaduct, three-track steel viaduct 0.41 miles long over Broadway, including an arch over 125th Street (then called Manhattan Street) and a station at that location. Broadway here is in a deep valley, so rather than build the subway under it, with steep grades, the valley was crossed on an elevated structure. The arched viaduct at 125th Street was added both as an ornamental device as well as to avoid having to reroute street railway trackage along 125th Street. The span of the arch is 168 feet, and 55 feet above the street. The ends of this section included short embankments in the middle of Broadway to portals north of 122nd Street and south of 135th Street. Construction began June 1, 1901. 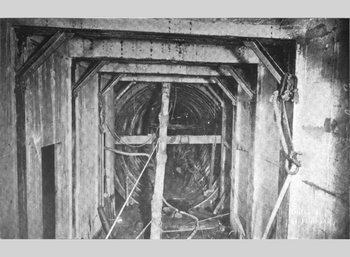 Section 13, 133rd Street portals to 182nd Street, 2.42 miles of three/two track subway and a five track underground yard between 137th Street and 145th Street; cut and cover south of 145th Street, rock tunnel northward. Stations at: 137th Street (City College), 145th Street, 157th Street, 168th Street, and 181st Street. Work began May 14, 1900. 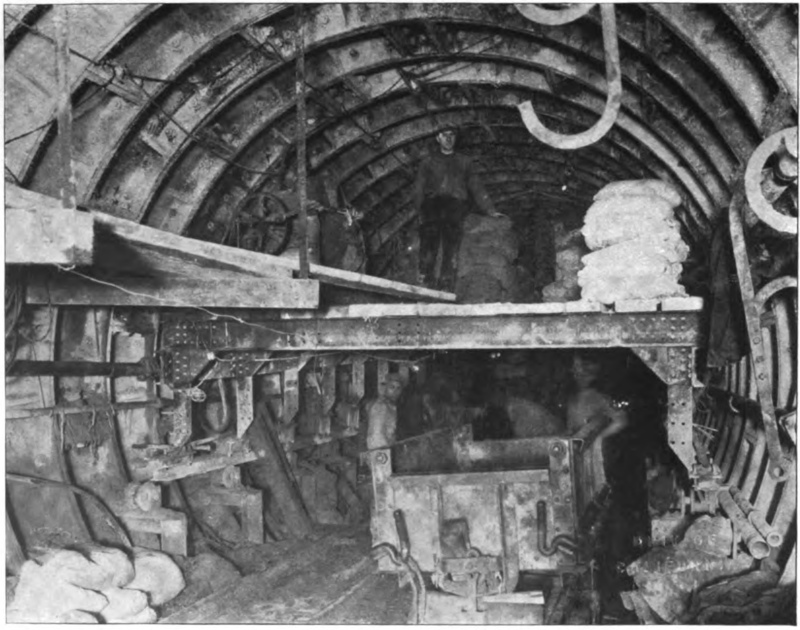 Section 14, 182nd Street to Dyckman Street, continuation of the Fort George Tunnel; 0.81 miles of two track subway. Work began on March 27, 1901. 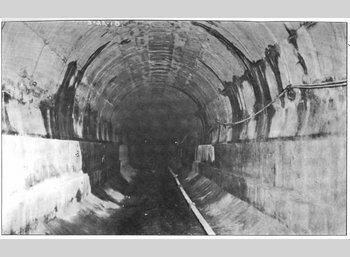 No stations were part of the original design; 191st Street was built later, 181 feet below the surface, and opened January 14, 1911. Section 15, Portals near Dyckman Street to northern terminus over Broadway, including bridge over the Harlem River Ship Canal. Stations at Dyckman Street, 207th Street, 215th Street, 230th Street. North of the Broadway Bridge, the original route turned on 230th Street, crossed the New York Central's Hudson line, and ended at Bailey Avenue near the New York Central's Putnam division station. 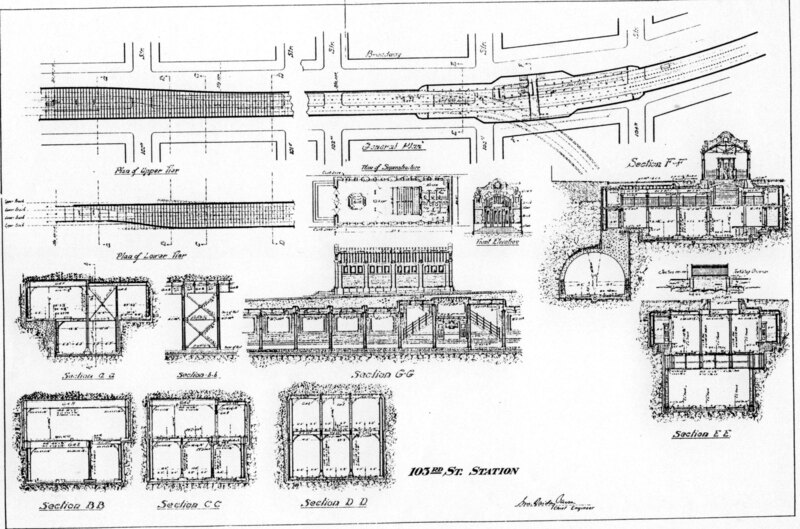 The 230th St. station was a two track, single island, elevated station. Service to 230th & Bailey began in March 1906. By 1907 the line was altered to include stations at 225th Street, 231st Street, 238th Street, and 242nd Street-Van Cortlandt Park; and 230th & Bailey was abandoned. 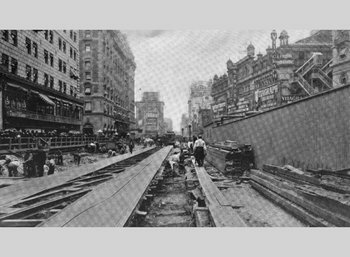 This line is made up of the First Subway north of Times square and extension therefrom to the south along Seventh avenue, Varick street. 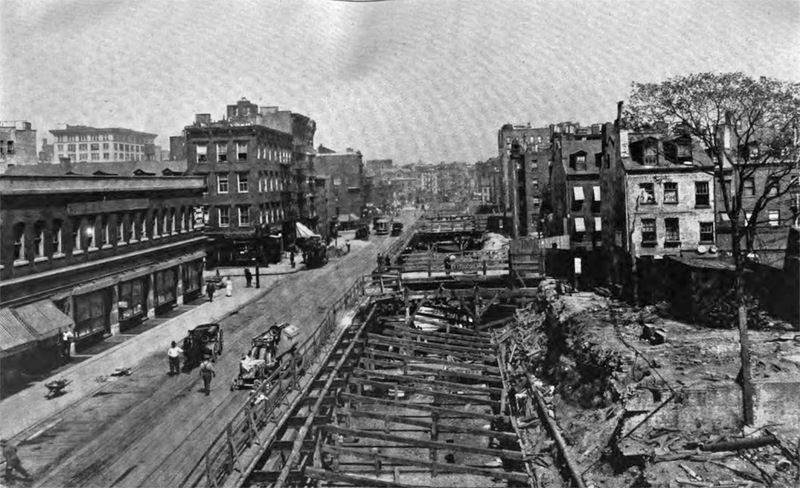 West Broadway and Greenwich street to a connection with the First Subway at the Battery. It is four-track to about Park place, and two-track south of that point. For the portion between 34th and 40th streets there are five tracks. It is designated as the Seventh Avenue subway, Routes Nos. 4 and 38, and divided into eight contract sections, No. 1-A, Nos. 1 to 6 inclusive, and No. 6-A. Routes Nos. 4 and 38, Section No. 1-A. — This covers the new work at Battery park and includes the actual connection to the First Subway there. The contractor is the Rapid Transit Subway Construction Company, a subsidiary of the Interborough Rapid Transit Company. Date of contract, September 4, 1914. Contract period, 31 months. Summary of contractor's bid, $472,244. Routes Nos. 4 and 38, Section No. 1. — This section extends from Battery park under Greenwich street to a point near Vesey street. Rapid Transit Subway Construction Company, contractor. Date of contract, June 19, 1914. Contract period, 33 months. Summary of contractor's bid, $2,121,077.25. Routes Nos. 4 and 38, Section No. 2. — This contract section extends from about Vesey street under West Broadway and Varick street to about Beach street. Degnon Contracting Company, contractor. Date of contract, March 13, 1914. Contract period, 36 months. Summary of contractor's bid, $3,059,522. A turnout is provided on this section for the Park Place-William Street line, which connects this line to the First Subway in Brooklyn. Routes Nos. 4 and 38, Section No. 3. — This section extends from about Beach street under Varick street and Seventh avenue extension to about Commerce street. Degnon Contracting Company, contractor. Date of contract, December 31, 1913. Contract period, 36 months. Summary of contractor's bid, $2,185,063.50. Routes Nos. 4 and 38, Section No. 4. 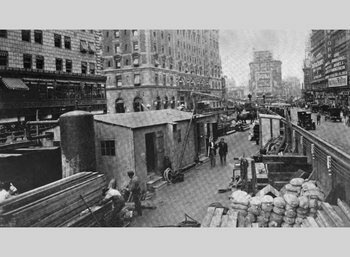 — This section extends from about Commerce street under Seventh avenue extension and Seventh avenue to a point near 16th street. United States Realty & Improvement Company, contractor. Date of contract, April 15, 1914. Contract period, 33 months. Summary of contractor's bid, $1,837,726.50. Routes Nos. 4 and 38, Section No. 5. — This section extends from about 16th street under Seventh avenue to about 30th street. United States Realty & Improvement Company, contractor. Date of contract, December 31, 1913. Contract period, 36 months. Summary of contractors bid, $2,401,306.75. Routes Nos. 4 and 38, Section No. 6. — This section extends from about 30th street under Seventh avenue to about 43d street. Rapid Transit Subway Construction Company, contractor. Date of contract, February 24, 1914. Contract period, 36 months. Summary of contractors bid, $2,292,943.50. Special provision is made at the Pennsylvania Railroad station, 33d street, for the interchange of traffic between the subway and the Pennsylvania Railroad. Changes have also been made in the plans to provide a connection to a hotel to be built on the east side of Seventh avenue by the railroad company. The plans for a concourse connecting the stations of all the intersecting subways at 42d street, and entrances from the street and through the Times and Heidelburg buildings, to provide for heavy traffic at this point, form a very important part of the work on this section. Routes Nos. 4 and 38, Section No. 6-A. — This contract section extends from below 43d street to above 44th street and includes the actual connection from the First Subway in Broadway, north of 44th street, with the new Seventh Avenue subway. Holbrook, Cabot & Rollins Corporation, contractor. Date of contract, August 6, 1914. Contract period, 33 months. Summary of contractor's bid, $421,566. Seventh Avenue Subway. 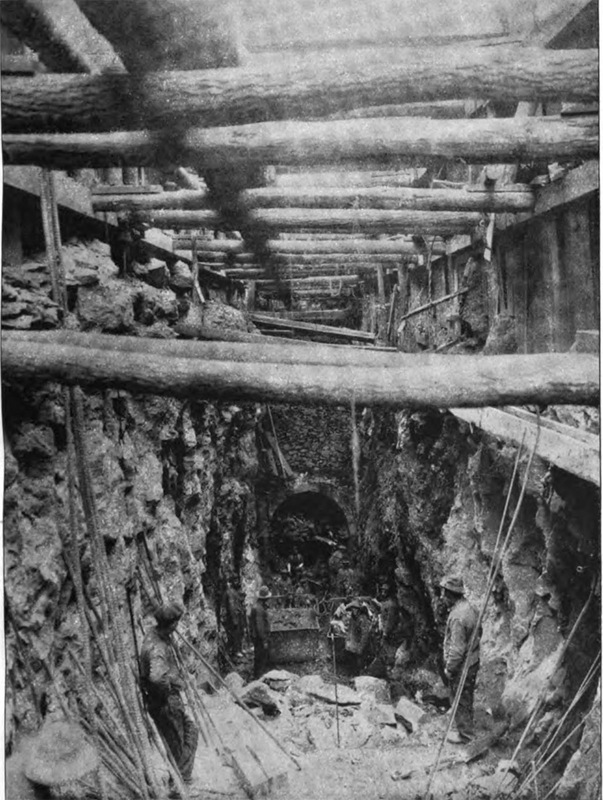 Temporary support of elevated railroad structure during subway excavation in rock cut. PSC report 1914. Seventh Avenue Subway. Contractor's hoisting plant, Hudson and Reade Streets. PSC report 1914. Seventh Avenue Subway. Varick Street, including widened portion, during progress of subway construction. 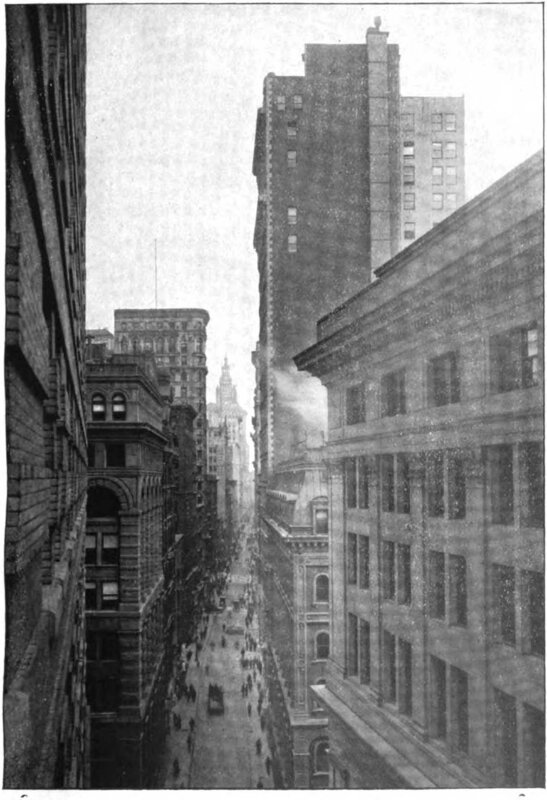 Looking north from Spring Street. PSC report 1914. Seventh Avenue Subway. Method of supporting temporary roadway. Trench bracing, etc. Seventh Ave. Extension at Commerce Street. PSC report 1914. Seventh Avenue Subway. 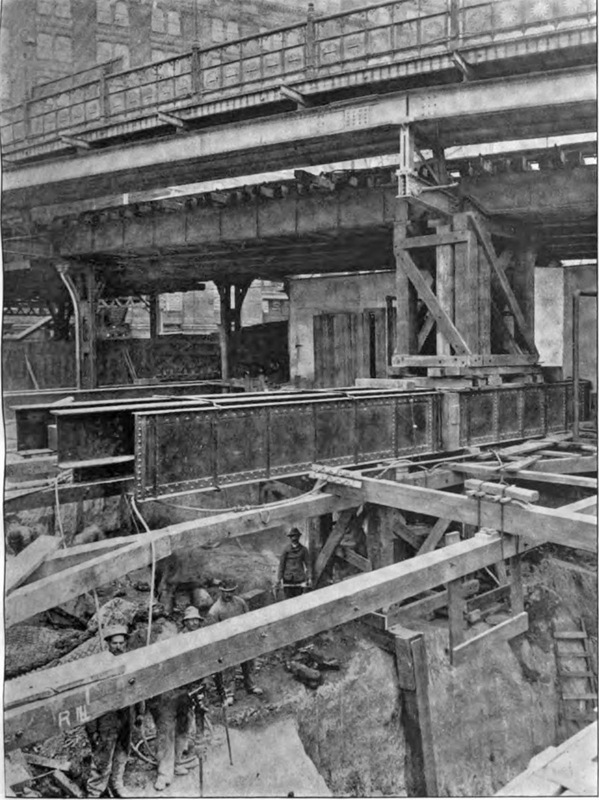 Gantry in course of construction and part of 24 inch overhead gas by-pass pipe at 19th Street. PSC report 1914. Seventh Avenue Subway. Contractor's plant, Times Square. PSC report 1914. Seventh Avenue Subway. 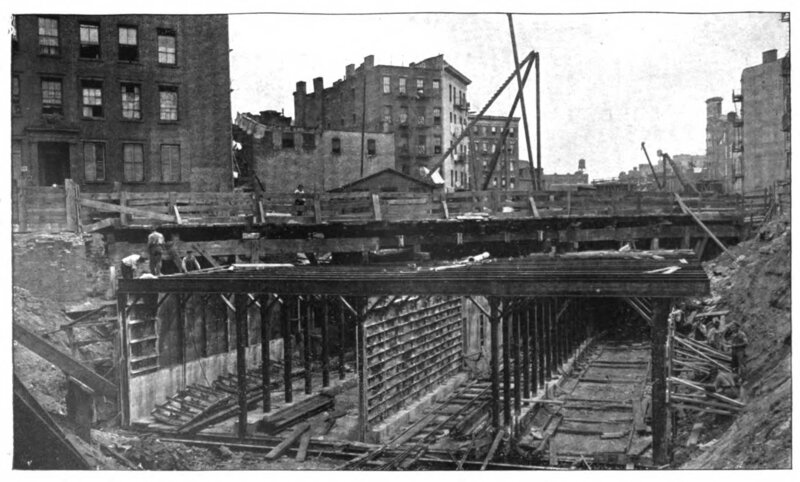 Excavation over roof of First Subway at 43rd Street. PSC report 1914. Seventh Avenue Subway. Rock cut for off-line sewer on West 30th Street between 8th and 9th Avenues. PSC report 1914. Seventh Avenue Subway. 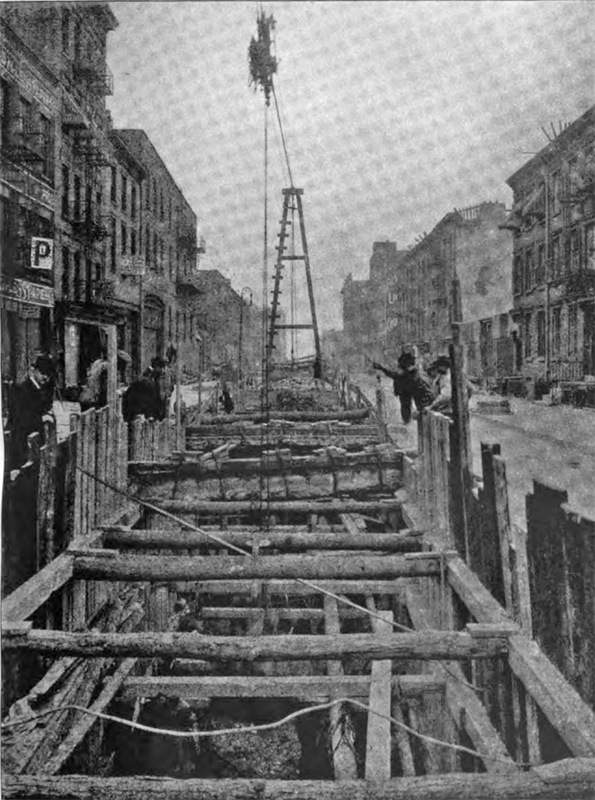 Method of timbering trench for off-line sewer along West 30th Street between 10th and 11th Aves. PSC report 1914. Seventh Avenue Subway. Underpinning Operation on West Broadway. Method of Supporting Cast Iron Columns of 6-Story Office Building. PSC report 1915. Seventh Avenue Subway. Unfinished Four Track Structure in Open Cut on Seventh Avenue Extension. PSC report 1915. Seventh Avenue Subway. 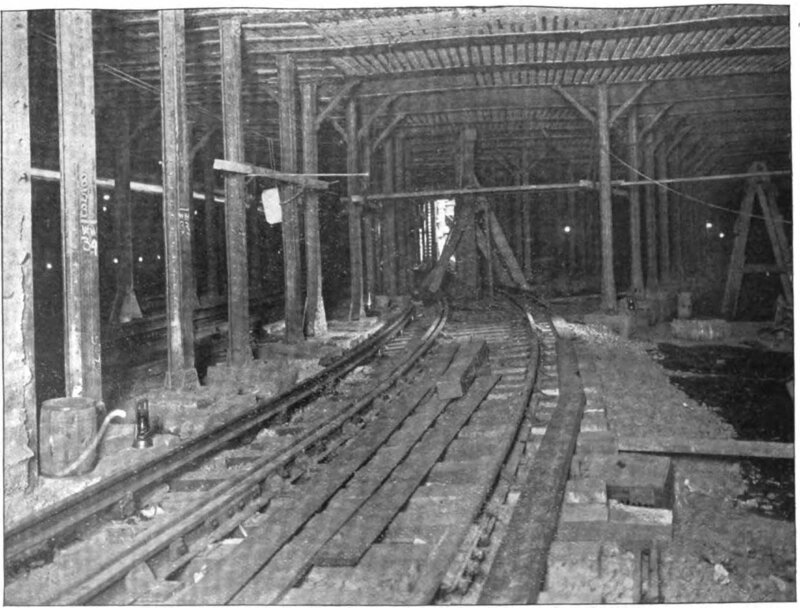 Connection Between Old and New Subways on Seventh Avenue between 42nd and 43rd Streets PSC report 1915. Seventh Avenue Subway. 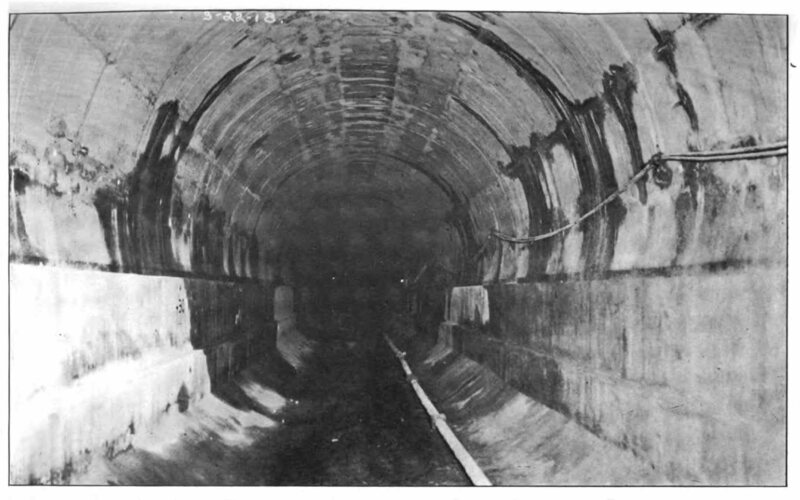 Sewer Between 35th and 36th Streets, Showing Reverse Curve Around Subway Spacing Chamber. PSC report 1915. Seventh Avenue Subway, Cut and Contractor's Plant, Park Place and West Broadway, Manhattan. PSC report 1916. Seventh Avenue Subway, Porch Columns of St. John's Chapel, Supported on Roof of Structure. PSC report 1916. 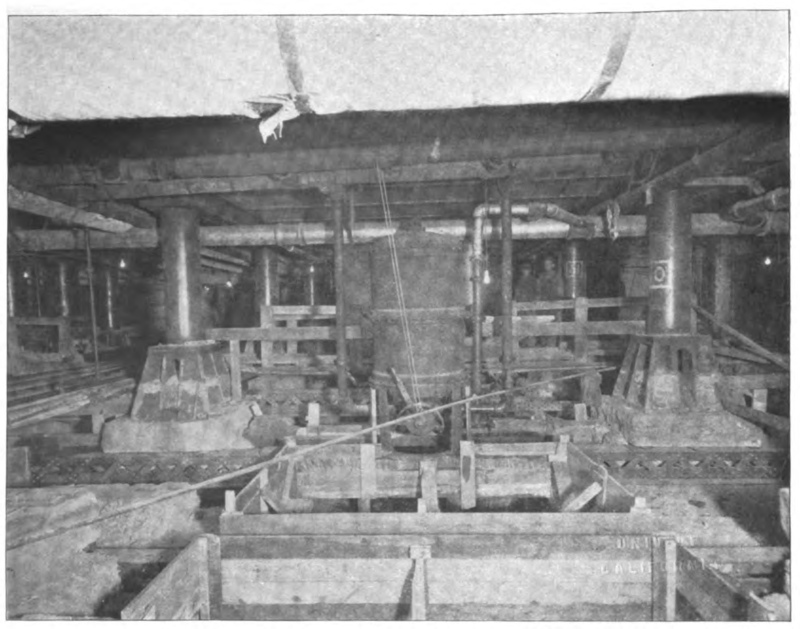 Seventh Avenue Subway, Southbound Island Platform, Times Square Station, During Construction. PSC report 1916. 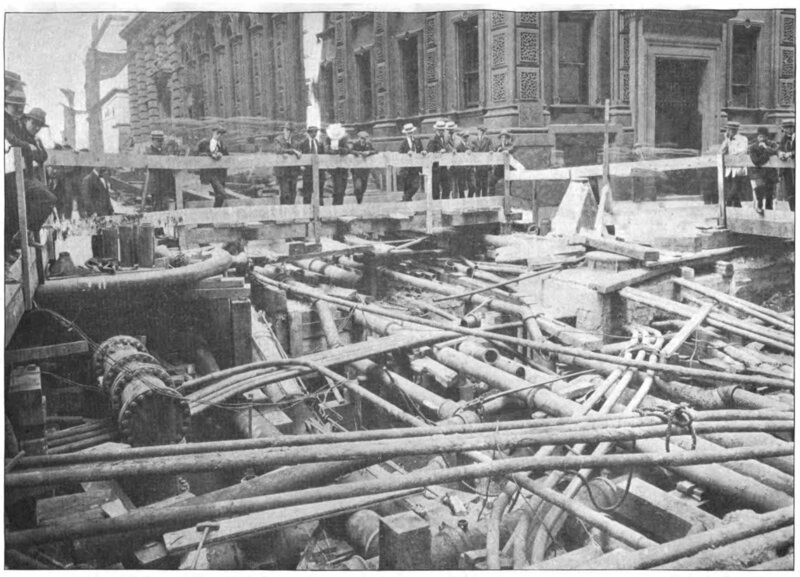 Seventh Avenue Subway, Excavation at Fulton and Greenwich Streets Exposing Top of Hudson and Manhattan Tubes. PSC report 1917. 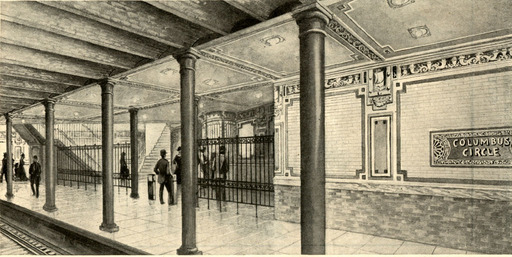 The Brooklyn extension was known as the "Park Place, William and Clark Street Subway" during construction, and included stations at Wall Street, Fulton Street, and Park Place. 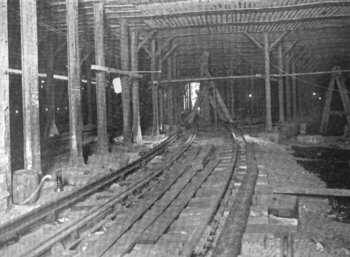 This is a two-track subway connection from the Seventh Avenue subway to the First Subway in Brooklyn. It thus doubles the Interborough Eapid Transit Company's accommodations for Brooklyn traffic to and from Manhattan. 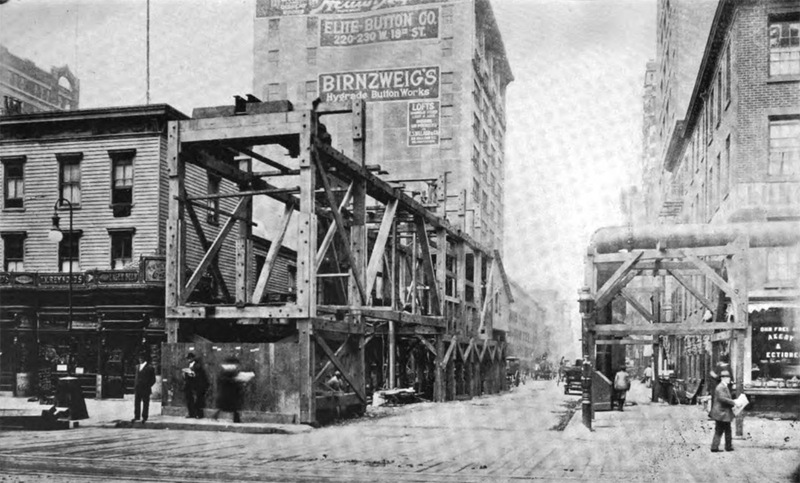 It leaves the Seventh Avenue subway by depressed tracks to avoid grade crossings and extends under Park place, the General Post Office, Beekman street, William street and Old Slip, to and under the East river, thence under Clark and Fulton streets to a connection with the First Subway at a point east of the Borough Hall station near Willoughby street. This line includes Sections Nos. 1, 2, and 3 of Route No. 48, and also part of Section No. 3 of Route No. 33. Route No. 48, Section No. 1. — Extends from about West Broadway, under Park place, the General Post-office and Beekman street, to about William street. Frederick L. Cranford, Inc., contractor. Date of contract, December 7, 1914. Contract period, 28 months. Summary of contractor's bid, $1,571,363.50. Two modifying agreements have been executed in connection with this contract. 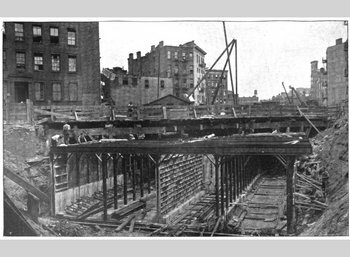 One provides for the construction under and supporting the Post-office; the other for the underpinning of the Broadway subway of the New York Municipal Railway Corporation, in connection with building the subway under it. Route No. 48, Section No. 2. — Extends from about Beekman street and William street, under private property, and William street to Pearl street. Contractor, Smith, Hauser & MacIsaac, Inc. Date of contract, December 7, 1914. Contract period, 28 months. Summary of contractor's bid, $2,254,670. The plans for station entrances, on account of the narrowness of William street, the congestion of traffic and varying conditions existing at different abutting buildings, may, in some instances, require modification. Route No. 48, Section No. 3. 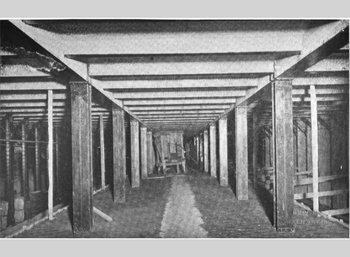 — This line extends under Old Slip, the East river, Clark and Fulton streets, to Liberty square in Brooklyn. This section is under construction by the Flinn-O'Rourke Company, Incorporated. Date of contract, August 6, 1914. Contract period, 42 months. Summary of contractor's bid, $6,469,915.25. 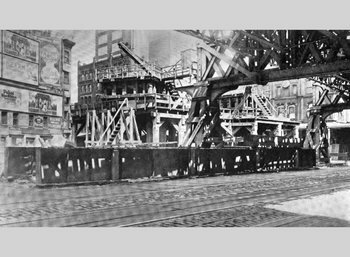 The contract for this section was let in combination with that for the New York Municipal Railway's East River crossing, the Whitehall-Montague Street tunnel route. 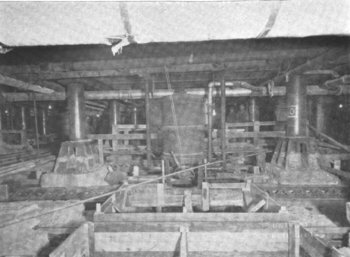 The tubes under the river are single-track cast-iron tubes, 17 1/2 feet in diameter. The design for the pump and feeder chambers has been changed from cast iron to steel and concrete construction. Park Place, William and Clark Street Subway. 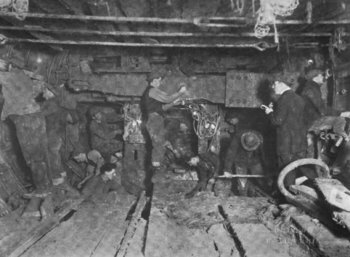 Tunnel Operation Beneath the First Subway. Lattice Girders in Place. PSC report 1915. Park Place, William and Clark Street Subway. 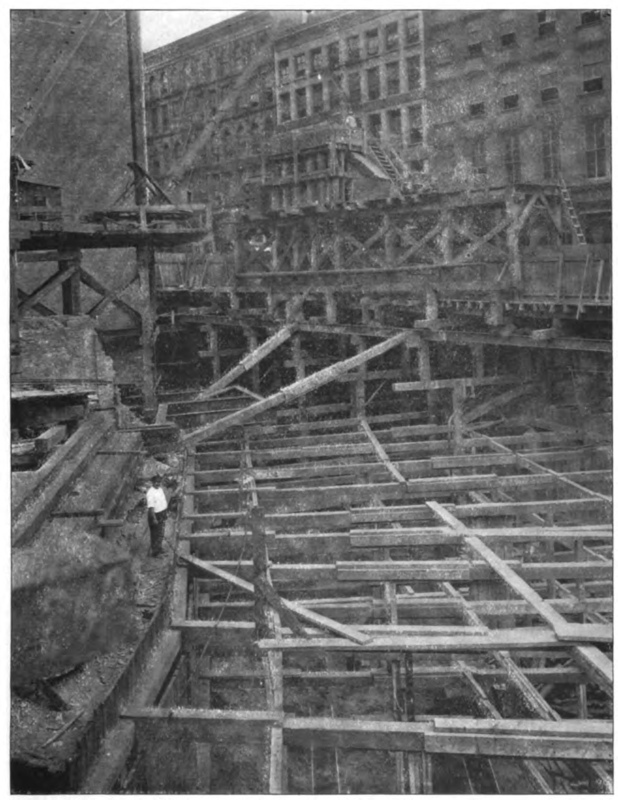 William Street North of Exchange Place, under which the subway is Being Constructed. PSC report 1915. Park Place, William and Clark Street Subway. Shield and Cast Iron Tunnel in River Heading of South Tunnel. PSC report 1915. Park Place, William and Clark Street Subway. Junction of River Tunnel and Land Approach in Manhattan. PSC report 1916. Park Place, William and Clark Street Subway. Special Underpinning Construction under Post Office Building. PSC report 1916. Park Place, William and Clark Street Subway. Grout Platform, Muck Cars, etc. in Under-River Tunnel. PSC report 1916. Park Place, William and Clark Street Subway. Safety Screen and Cast-Iron Lining, Under-River Tunnel. PSC report 1916.
and Clark Street Subway. Reading Plumb Line, Lead Rods, etc. 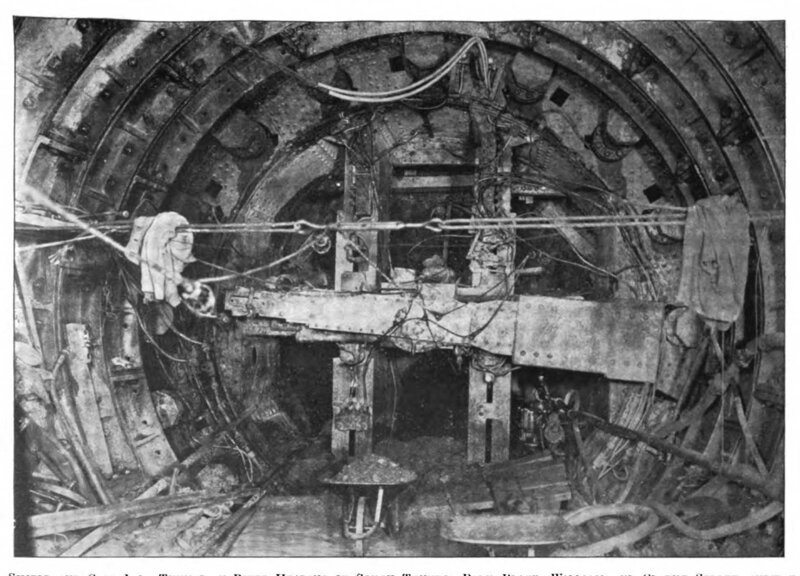 Preparatory to Advancing Excavation Shield in Under-River Tunnel Construction. PSC report 1916. Park Place, William and Clark Street Subway. 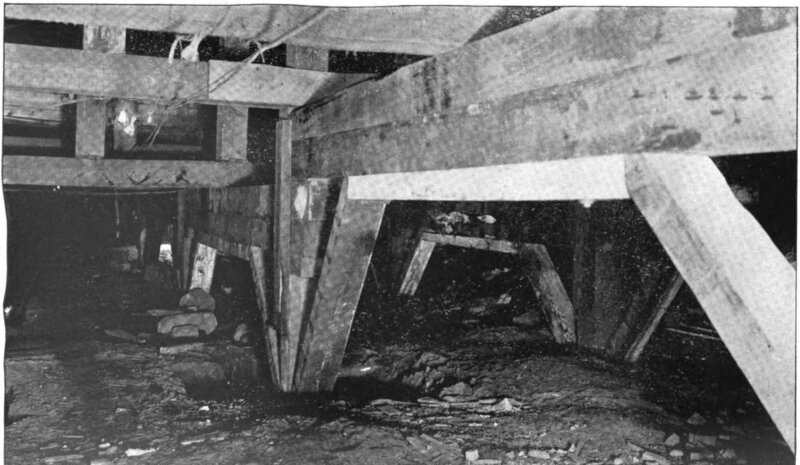 Tunnel Excavation Shield Bulkheaded and Timbered During Temporary Cessation of Work. PSC report 1916. Park Place, William and Clark Street Subway. Temporary Support of Old Post Office Building; Roof Constructed in Advance of Subgrade Excavation. PSC report 1917. Park Place, William and Clark Street Subway. Pipe Restoration in Progress at Intersection of Wall and William Streets. PSC report 1917. Park Place, William and Clark Street Subway. Finished Concrete Lined Tunnel. PSC report 1918. 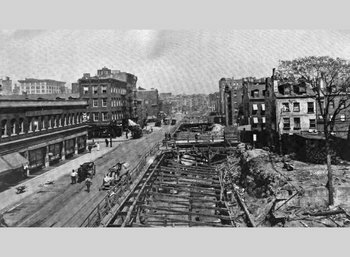 The disconnection of the 42nd Street tracks from the main line, and the connection of the new 7th Avenue subway was done on the evening of August 1, 1918 (a Thursday). The preparation for the work was so extensive that the cutover took only a few hours. Work began at 8:00 pm and shuttles were running on the crosstown tracks by 10:00 pm. The "H" system was in operation! (So-called because the lines of the IRT now resembled the letter "H".) The IRT installed at Times Square and Grand Central a system of red and green lines and lights to direct passengers to the shuttle stations from the new main line stations (colors which would continue to identify these two main lines of the IRT until this very day!). 1 The station at South Ferry has undergone several major changes in its lifetime. The first station at this location was a single track loop and platform, built in 1905 as part of the IRT Brooklyn Extension, along with the IRT stations on Broadway south of City Hall (Fulton Street, Wall Street, and Bowling Green). The loop station served to terminate some trains in Manhattan at a location of high passenger flow (the various ferry terminals and docks in the area). The single loop track and station operated in this manner until the IRT West Side Line reached South Ferry in 1918. The "outer loop" platform was the first built at this location. It is extremely short (only five cars fit), so passengers wishing to exit at this station have to ride in the first five cars. There are also gap fillers (small extendible platform segments) used to bridge the spaces between platform and middle door on the cars. On the platform itself was an active tower which includes indicator lights for the gap filler signal at the front end of the platform. The gap filler signal is a one-tiered signal lit up red when the filler is extended. Under the signal a sign reads "GF Signal" which is lit in white when the signal is clear and the gap fillers are fully retracted. The gap fillers retract via a proximity sensor that detects the car moving against the edge of the gap filler. While not harsh like 14th Street on the Lexington line, there is an announcement to "stand clear of the moving platform." The outer platform decoration was quite ornate with large "South Ferry" mosaic name panels and terra-cotta sailing ship plaques by Heins & LaFarge. The inner platform has small "SF" tile mosaics. There are fancy rosettes around removed old light fixtures and along the ceiling. The station opened in 1905 and closed in 2009, replaced by a new island platform station built adjacent. The damaged caused by Hurricane Sandy on October 29, 2012, caused that new station to close, and the Outer Loop station was in better shape, thus it was reopened on April 4, 2013. More details below. 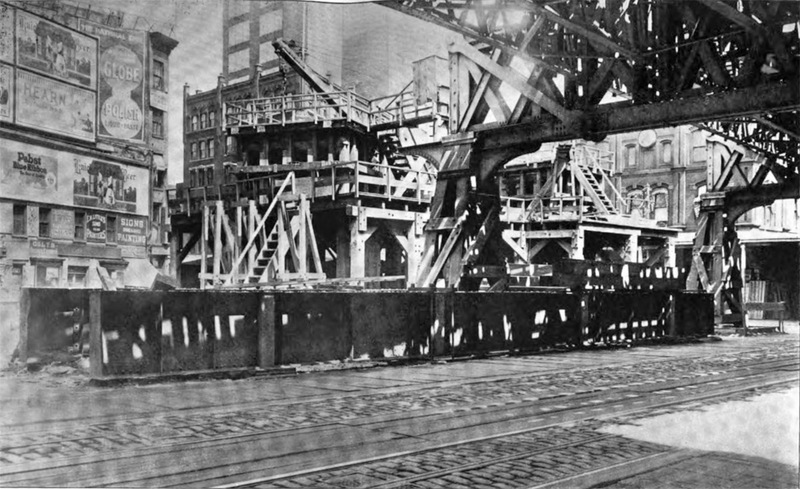 As part of the West Side Line construction, a second loop track and platform was constructed on the inside of the first. The tracks were configured in such a way that the inner loop and platform was directly connected to the tracks from Bowling Green, and the outer (earlier) loop and platform would be served by the trains from the West Side line. Essentially a separate station, the South Ferry inner loop platform was used until 1977, mostly by a shuttle to the Bowling Green station on the Lexington/Brooklyn IRT. 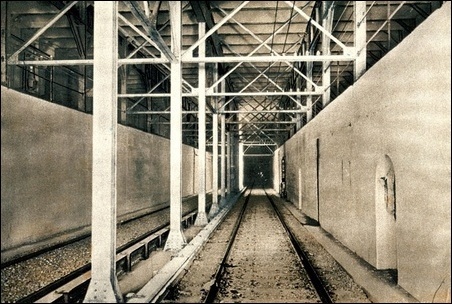 Because of the sharp curve (even sharper than the outer loop), trains could open only their center doors at the inner loop station, and so instead of a full platform face, the platform was mostly walled off from the track with arched openings along the wall where the cars' center doors would be. Starting in the late 1950s, when the new R-type cars displaced most of the original IRT rolling stock, trains arriving from the Lexington line on nights and weekends were rerouted to share the outer loop, because on the new cars it was not possible to selectively open only the center doors. The weekday shuttle used specially modified cars that opened only center doors, and continued using the inner loop until service ended in 1977. The track past the inner loop is still used to turn the #5 train when it is terminating at Bowling Green and not running to Brooklyn. The inner loop platform at South Ferry is now used for crew quarters, offices, storage, etc. and has a separate entrance from the fare zone upstairs. There was no free transfer between trains on the two platforms. The platform walls on the inner loop station were decorated with small mosaic friezes similar to those found at other Dual Contracts-era stations. After September 11, 2001 the lower West Side IRT line had some upgrading done to it, including the construction of a new island platform station (with straight platform edges, no more loopy curves) at South Ferry. The new station would be able to platform two 10-car trains simultaneously and allow higher speed operation in and out of the station, ostensibly to improve running time of the long local service on the West Side. There are three exits, all fully ADA compliant. The north exit leads to Battery Park, State Street and Pearl Street. Escalator leads to an intermediate level with another escalator to street level HEETs. A temporary canopy was found here at street level at Peter Minuet Plaza which is still being restored. The center exit leads to South Ferry, Whitehall Street and State Street. There is an escalator here and a glass arched canopy at the street level which has access via HEETs. The intermediate level runs from southwest to northeast and allows a train spotter's view of track and platform. The main exit is at the south end. Escalators bypass the intermediate level which has a gray speckled floor tile and is glass enclosed thereby allowing a train spotter's dream view of trains and the platform. The exit leads to the ferry terminal which is across a small plaza area. This exit has a glass canopy. The main mezzanine has a view of a historic wall, made of rubble stone, located on the wall behind the booth. The railing separating the paid and unpaid area features metal leaves and stems. The station agent booth is located in the passageway to the BMT Broadway Line at Whitehall Street station-- mere feet from the full time booth at Whitehall Street. On October 29, 2012, the new South Ferry station suffered extensive flooding damage caused by Hurricane Sandy. 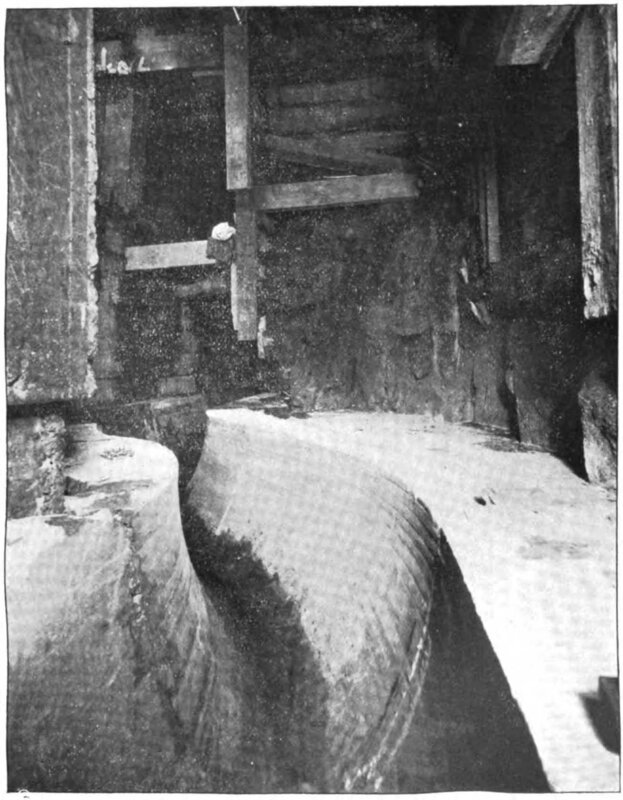 Water filled the station from track bed to mezzanine. 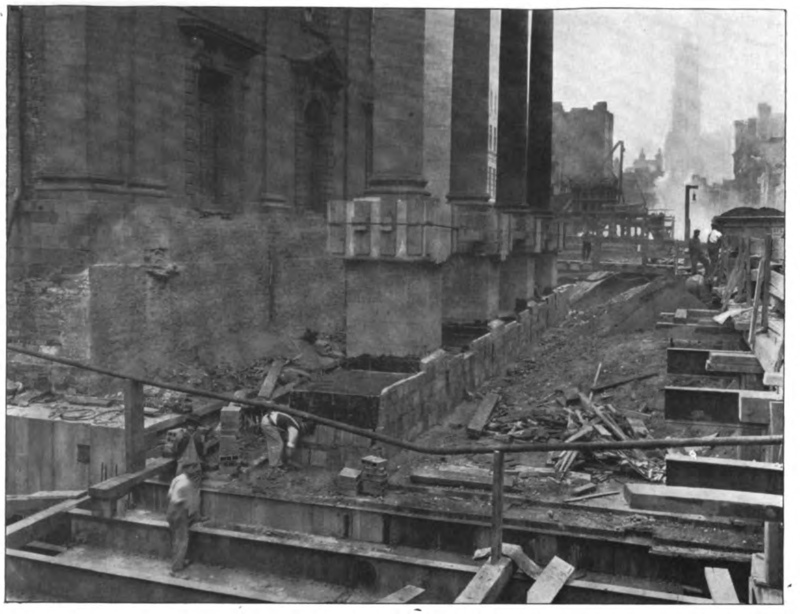 After the initial flood cleanup, the station remained closed with Rector Street serving as the downtown terminal of the Broadway local/#1 train. It was determined that the former Outer Loop station, still in-situ, was in better condition, and so that station was reopened on April 4, 2013. The new island platform station is being renovated, with new waterproofing and signal room relocations as part of the project. It reopened June 27, 2017. Artwork South Sails, Sandra Bloodworth, 1990. This artwork was located in the stairway from station house to platform at the old "outer loop" station. Local station with two side platforms alongside two tracks. There are exits with separate fare controls at the end of each of the two side platforms, and an additional exit is located at the center of the downtown platform. There is also a black cinder block area on the southbound platform, possibly a sealed up crossunder since there is an apparent seam in the northbound wall at the same location. Mosaic decoration: Original Dual Contracts mosaic tiling along the platform includes ceiling frieze in brown/beige with yellow/brown diamond highlights; large "RECTOR ST." name tablets with grey-green background and brown trim; and occasional small "R" tablets in the grey-green color scheme in the frieze. Between Oct. 29, 2012 and April 4, 2013, trains terminated here due to water damage at South Ferry caused by Hurricane Sandy. Local station with two side platforms alongside two tracks. The station at Cortlandt Street has had a number of incarnations since its 1918 opening. Originally situated under Greenwich and Cortlandt Streets, it was a typical Dual Contracts-era side platform station with two tracks, and standard mosiac decoration of the period. One of the original Cortlandt Street mosaics is preserved at the New York Transit Museum, and a photo of one of these mosaics in place, prior to renovation, is displayed in the photo gallery. The late 1960's construction of the World Trade Center eliminated both Greenwich Street and Cortlandt Street above the station. The station was redesigned with exits to the World Trade Center concourse in the center and south end, and a street exit to Vesey Street at the north end. The station was given a bland beige brick and concrete overhaul, removing its 1918 mosaic tablets and icons. This station was destroyed in the terrorist attacks of September 11, 2001. The photos below depicting the damage were released to the press by MTA New York City Transit shortly after September 11th. The subway tracks have been rebuilt through this area but the location of the station remains unfinished; to be completed later during reconstruction of the World Trade Center complex. As of 2012, no construction of a station here has been started. Express station with two island platforms and four tracks. The two-track branch to/from South Ferry merges with the two-track branch that serves Park Place, Wall Street and Brooklyn just south of Chambers Street station. South Ferry trains run on the "local" side and Brooklyn trains run on the "express" side. Mosaic decoration: Original Dual Contracts frieze along the trackside wall near the ceiling, with occasional mosaic "plaques" depicting the first building of Kings College (now Columbia University), which was located around the corner on Park Place. There are uptown/downtown directional mosaics in the central mezzanine. This station has a high ceiling and an active tower on the south end of the southbound platform, the ends of which split--- the local portion rises and the express portion descends, matching the track alignment (a result of the platform lengthening projects). A handrail separates the two sub-platforms. There is a workspace for the NYCT Electronic Shop above the north end of the platforms. As part of a 2007–2009 renovation, elevators were installed in the station (two from platform level to the mezzanine and one from fare control to the streets) to make it ADA-accessible for people with disabilities. Local station with two side platforms alongside four tracks. Mosaic decoration: Original Dual Contracts frieze in brown/beige; large name tablets reading "FRANKLIN ST."; occasional "F" mosaic tablets in the frieze. The wall tile below the frieze and surrounding the name tablets was replaced during a 1990s renovation. There are also directional mosaics reading "To Franklin St." and "To North Moore St."
There are "store window"-style art displays on the southbound platform and a newsstand on the northbound side. There is no crossover between uptown and downtown within the fare-paid area. On the street level there is a kiosk reminiscent of the original IRT kiosks, although this one was installed during the station's renovation. Local station with two side platforms alongside four tracks. The platforms are slightly offset. 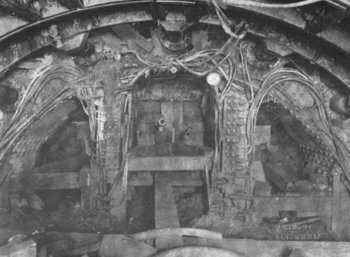 There is evidence of an apparent sealed up crossunder on both platforms. This station was renovated in 1992 by New York City Transit Employees (as opposed to an outside contractor) as indicated by a small plaque near the token booth. Fare control is on platform level for both sides with entrances on both sides of Varick Street on the northern side of Canal Street. Mosaic decoration: Original Dual Contracts mosaic frieze, large name tablets, and small "C" tablets along the platform walls. There are also small mosaic "plaques" representing St. John's Chapel, which was located on Varick Street facing St. John's Park. Local station with two side platforms alongside four tracks. Fare control area is at platform level, but Only the Bronx-bound side has a token booth. There are no crossovers or crossunders, though evidence of a sealed-up crossunder is present at the north end by the main fare control areas. A secondary exit is at the south end of both platforms. Renovated in the 1990s. Mosaic decoration: Both platforms have Dual Contracts mosaic trim lines with blue and green borders, "H" tablets on a light blue background, and large name tablets reading "HOUSTON ST." There are also directional tablets in the same style. Local station with two side platforms alongside four tracks. There are sealed up crossunders at each end. Fare control is at platform level near the center. Mosaic decoration: Original Dual Contracts mosaic frieze along the platform walls; large name tablets reading "CHRISTOPHER ST."/"SHERIDAN SQ." on two lines; and smaller mosaic panels indicating a secondary name of "New York University". In the frieze are mosaic "plaques" depicting the old State Penitentiary at West 10th St.
Express station with four tracks and two island platforms. The ceilings of the platforms are unusually high and have old-style incandescent light fixtures, which have not been used in a long time. There are three crossovers (mezzanines) between the platforms with exits at 12th, 13th and 14th Streets. Mosaic decoration: Original Dual Contracts frieze on the trackside wall with occasional "14" mosaic tablets. There is a closed passageway to the 8th Avenue IND station, complete with mosaic signing, just past the token booth at 14th Street. It is behind a floor to ceiling gate and is chained shut. A passageway to the IND 6th Avenue Subway is still open. Local station with two side platforms alongside four tracks. There is no crossover or crossunder and no evidence of a former one. 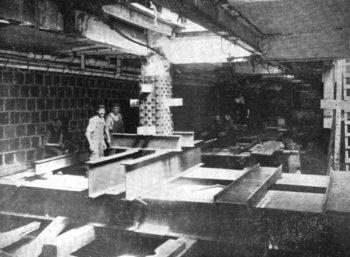 The token booths are built into the tile. Fare control is on platform level, with the main entry/exit at the four corners of Seventh Avenue and 18th Street while the northbound side leads to the eastern corners. An additional exit at the north end of each platform leads to 19th Street. Mosaic decoration: Original Dual Contracts mosaic frieze with small "18" tablets and large "18th STREET" name tablets line the platforms. There are also "to 18th Street" and "to 19th Street" directional mosaics. Local station with two side platforms alongside four tracks. Fare control is at the center of the platforms at platform level. There are no crossunders or crossovers, and no evidence of former ones. Mosaic decoration: Original Dual Contracts friezes, name tablets reading "23rd STREET", and occasional "23" mosaic tablets are along some portions of the platforms; platform extensions are tiled in standard white subway tile with no decoration. Local station with two side platforms alongside four tracks. All fare control areas are on platform level; one area is at the center of each platform, and there are secondary exits at the south end of each platform. There are no crossovers or crossunders. Mosaic decoration: Original Dual Contracts mosaic frieze, name tablets, and numeral "28" mosaics along the platform walls; plus directional mosaics "to 28th St." and "to 27th St." There are diamond accents in the tile at the fare control. This station was listed on the National Register of Historic Places in 2005. Express station with four tracks, two side and one island platforms. Platform configuration here is unusual for an express station but identical to the platform arrangement at the 34th Street-Penn Station station on the IND 8th Avenue Line. There's a center island platform for the express trains and two side platforms for the locals. Due to the proximity of Times Square and anticipated passenger traffic, the transfer between express and local was discouraged by the layout. Entry and exit from the station is through a lower level mezzanine. The fare control is in the lower mezzanine, which also connects directly into Penn Station. Only the northbound local platform has an exit directly to the street, and there is an additional fare control area for that exit. Mosaic decoration: Mosaics tablets include "Pennsylvania", "To Penna RR", "to 34th St." and "to Uptown and Downtown" express trains. There are also "P" mosaic tablets in the frieze. While built at different times (1904, 1917-1918, and 1927), 42nd Street-Times Square is a massive station complex, comprising four stations, on the IRT Times Square-Grand Central Shuttle, IRT West Side Line, BMT Broadway Line, and IRT Flushing Line, all joined together by a vast mezzanine and underground warren of connecting passageways; and a fifth station a long way west by underground passageway, on the IND 8th Avenue Line at 42nd Street-Port Authority Bus Terminal. In 1999, a $244 million dollar renovation of the Times Square complex began. The goal is to reduce congestion and improve rider access, comfort and safety by improving visual lines and increasing pedestrian capacity. The main corridor is being widened 15 feet and the number of sharp corners reduced; ADA compliance is being introduced with elevators and escalators. The reconstruction included a new entryway on the south side of 42nd Street between 7th Avenue and Broadway, featuring a bright neon and colored glass flashing sign with the train route symbols and the word "Subway". The street level fare control at this site features restored original "Times Square" mosaics from the Contract One (now Shuttle) station walls. Some relative depths of stations in the Times Square complex are as follows, +/- 10 feet. The station serving the IRT West Side Line is an express station with four tracks and two island platforms. There are stairways leading up to various mezzanine levels, and also down, to connecting passageways to the IRT Flushing Line and the IND 8th Avenue Line. Evidence of former stairways leading down exist at various spots along the platform. The main exit is at the north end, leading directly to the Shuttle and BMT stations. Just north of the station you can see the curved shuttle tracks and the track connection from Shuttle track 4 to the uptown local track. Trackways remain where shuttle tracks 1, 2, and 3 connected to the uptown express and both downtown tracks. 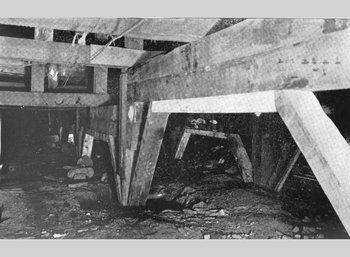 The 7th Avenue line station at Times Square was the site of a 1928 wreck which killed 16 people, the second worst in NYC Transit history. Artwork New York in Transit, Jacob Lawrence, 2001. Located above the midlevel mezzanine between the Shuttle area and the BMT Broadway Line. Artwork The Return of Spring-The Onset of Winter, Jack Beal, 1999. In the IRT West Side Line mezzanine. Artwork Times Square Mural, Roy Lichtenstein. In the space between the three lines, closest to the IRT Shuttle. Easiest seen when entering from the new headhouse in Times Square. Artwork Times Square Times: 35 Times, Toby Buonagurio, 2005. Mostly located around the Shuttle and BMT line mezzanines. Artwork The Revelers, Jane Dickson, 2007. Mostly located in the transfer corridors between the BMT and IRT Flushing Line. Artwork Untitled, John Blackford and James Fisher, 2003. West 42nd Street and 7th Ave, S/E corner entrance. Local station with two side platforms alongside four tracks. If you were riding a train northward from South Ferry, this is the first station you would arrive at along the West Side IRT that was constructed as part of Contract One, the first subway construction contract, which opened in 1904. This station was renovated in the 1980s or 1990s and most of the original tile work was removed. One of the original faience plaques has been preserved at the New York Transit Museum. Station diagram. Rapid Transit Board report 1904. A typical station of the new subway, showing proposed arrangement and architectural details. Drawn by H. M. Pettit. Local station with two side platforms alongside four tracks. The side walls of the station feature large name tablet mosaics and both mosaic and faience plaques of Christopher Columbus's three ships. A mezzanine underneath provides access to the IND station at Columbus Circle. The downtown platform areas are much larger than necessary for the interchange with the IND. They are deliberately ample to allow for an expansion of this station into a new express stop. The downtown local and express tracks would, under an early 1950s NYCTA plan, weave out to accommodate a new center express platform. The new downtown local platform would be in the bays. Thus this station would have resembled Pennsylvania Station with three platforms. To ensure the bays remained available, the NY Coliseum was set back from the street. As part of this plan the 72nd Street station would become a local stop by walling off the express tracks. The express run would be from Times Square, then Columbus Circle, then 96th Street. A renovation project in 2010-2011 restored the original name tablets and mosaics but did not attempt to build the extra platform as described above. Several reproduction name tablet mosaics were installed during this project. Also, the renovation work revealed a section of wall with experimental tile installations installed during the construction of the line 1900-1904. 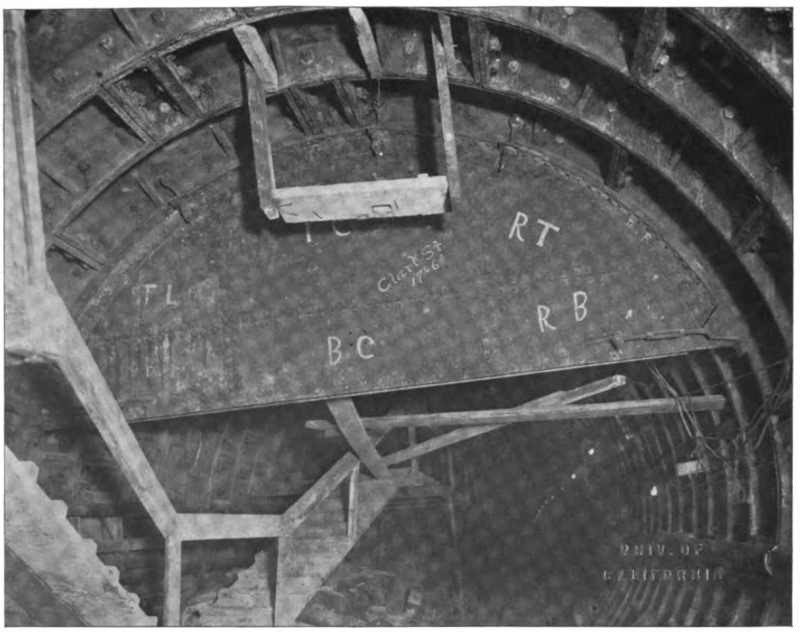 Diagram of the subway construction underneath the Columbus Monument. Click to enlarge. 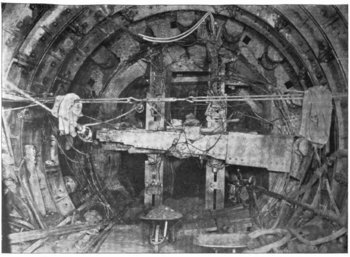 See Also Difficult Engineering in the Subway (1902), a discussion of the construction techniques involved in underpinning the Columbus Circle monument. Local station with two side platforms alongside four tracks. Recently renovated with a "retro look" makeover, complete with new plaques and tablets in the original 1904 Heins-LaFarge style. The new plaques are made of faience and while they look like they might have been restorations of original work - they are not. The new plaques have the letters "LC" embossed over the "66"; remember, Lincoln Center did not exist in 1904, when the station was opened. The walls are being refinished with white panels, which are actually large mosaics of tiny opalescent tiles. Tan Norman brick surrounds and accents these panels. The ornate ceiling and plaster rosettes around the old light fixtures have been lovingly restored, but the bulb sockets have been covered over. Express station with four tracks, two island platforms. This is a most peculiar station for a farsighted railroad like the IRT. It was totally inadequate from its opening day, yet it is the best preserved of the original IRT express stations. 72nd Street long suffered from narrow platforms and narrow stairways to the headhouse and fare control. To maximize the space in the headhouse, free crossover between uptown and downtown directions was artificially denied by the arrangement of the turnstiles and gates. A renovation ending in 2002 provided a second headhouse on the north side of 72nd Street, additional stairways from the platforms, and a widened uptown platform at the north end. The widening required cutting into the sidewall of the tunnel and realigning the uptown local track. However, the platforms are still fairly narrow considering the passenger load at this station. A 1950s plan considered converting 59th Street/Columbus Circle into an express station and 72nd Street into a local station (by walling off the platform along the express side). The express run would have then been from Times Square, to Columbus Circle, to 96th Street. While that might have alleviated some crowding at 72nd Street the vibrancy of the neighborhood around 72nd Street probably requires the express trains' stopping here. Local station with two side platforms alongside four tracks. There are no crossunders, but there is a street-level fare control station house. The ceiling is ornate and has a raised ornate tile border where the ceiling meets the tile. Local station with two side platforms alongside four tracks. This station is partly renovated and features mosaic "photograph paintings" and some poetry over most of the platform walls. Local station with two side platforms alongside four tracks. 91st St. was in operation as a local station from 1904 to 1959. It was closed during a system-wide platform lengthening project, to accommodate longer trains. The lengthening created an exit from the 96th Street station only three blocks further north, so it was impractical to lengthen the platforms here and the station was closed to speed service. The 91st Street station is fairly well-preserved if you disregard the graffiti and spray paint cans all over the place. Express station with four tracks, two island platforms; two disused side local platforms. 96th Street was built in a similar fashion to the Contract I express stops at Brooklyn Bridge and 14th Street: two island platforms for the express trains and two shorter side platforms for the local trains. Until 2010, access to the station was provided from stairways along the sidewalks of Broadway to the side platforms; access to the center island platforms is via a crossunder passage running underneath the platforms. Because of the location of a large sewer line under 96th Street, no mezzanine was built at this station, thus requiring the underpass. Before the advent of ten-car locals the side platforms were used for local trains; since it would have been operationally logical to use the center island to allow local passengers easy transfer to the express, the local trains may never have used the side platforms exclusively for service, and in any event the practice did not last long. 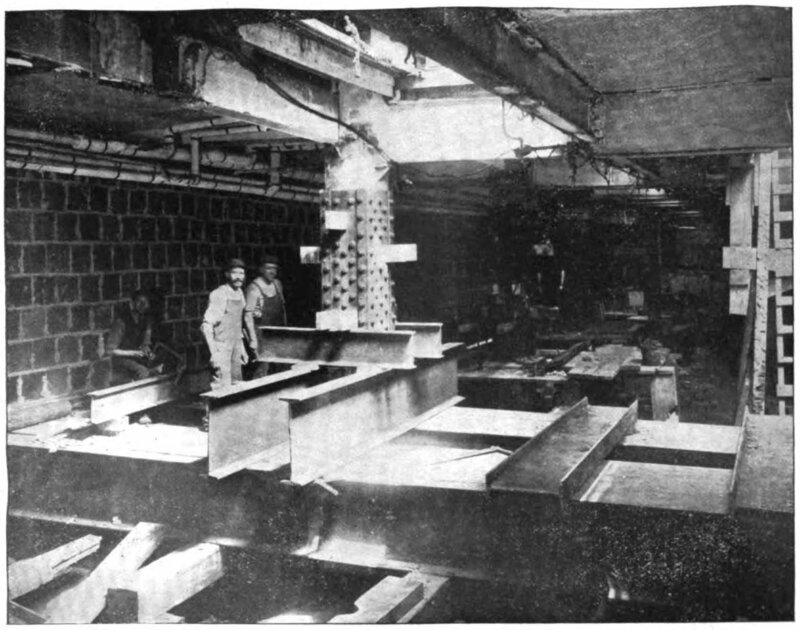 At Brooklyn Bridge and 14th Street, these side platforms were walled off, but at 96th Street they were kept open because they were used to access the underpass which provided access to the island platforms. The station was renovated in 1950 to accommodate longer trains. It was both extended (with a second entrance on 94th St. created) and widened (the tracks were moved and the platforms were widened). 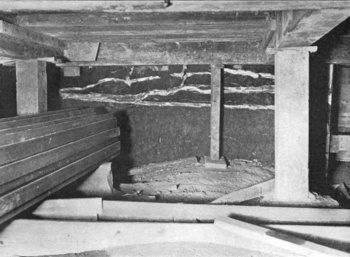 You can see differences in the walls and ceiling at the south end, and you can still spot a seam in the platforms where they were widened. 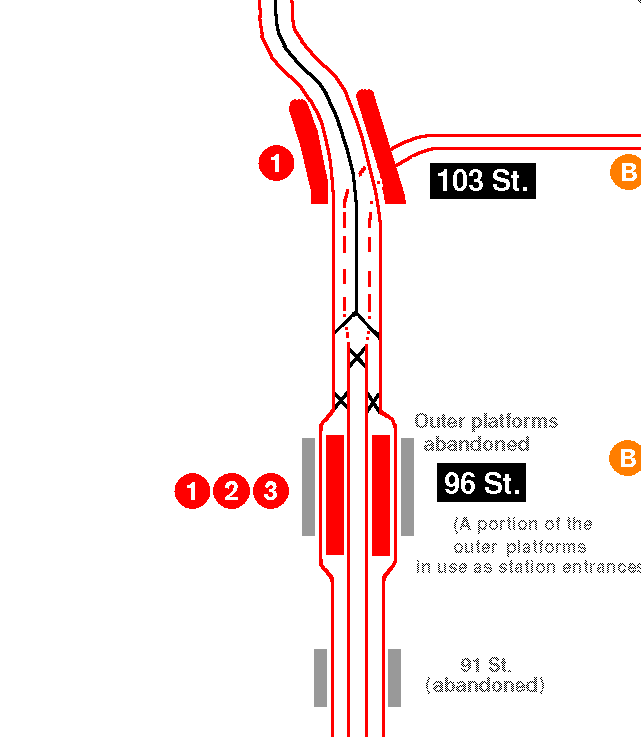 The creation of the new entrance at 94th St. led directly to the closure of 91st Street, as it would have been impractical to lengthen it for 10-car local trains with 94th Street so close by. A new headhouse structure was built in the median of Broadway, which opened in 2010. New stairways and an elevator were provided to each island platform. Riders no longer need to go down and back up to enter or exit the station. North of 96th St. Station, the express tracks descend to head under 104th Street to Lenox Avenue and the Bronx while the local tracks remain on the upper level. After the express tracks turn off, a new center track starts at approximately 100th Street. There is a structure in the median of Broadway on the north side of 96th Street that seems like it might have been a headhouse for the station similar to the one at 72nd Street. Was there once direct entrance to the platforms from the street via this headhouse? Photographic evidence of this intersection indicates that the structure post-dates the year 1924; and anecdotal evidence from 1947 notes that the building was used as a "comfort station" (a.k.a. public restroom). The conclusion on the matter, then, is that this building is not and never was used as a subway entrance; nor was it even built by the IRT company. The structure is now a community center called the West Side Broadway Mall. 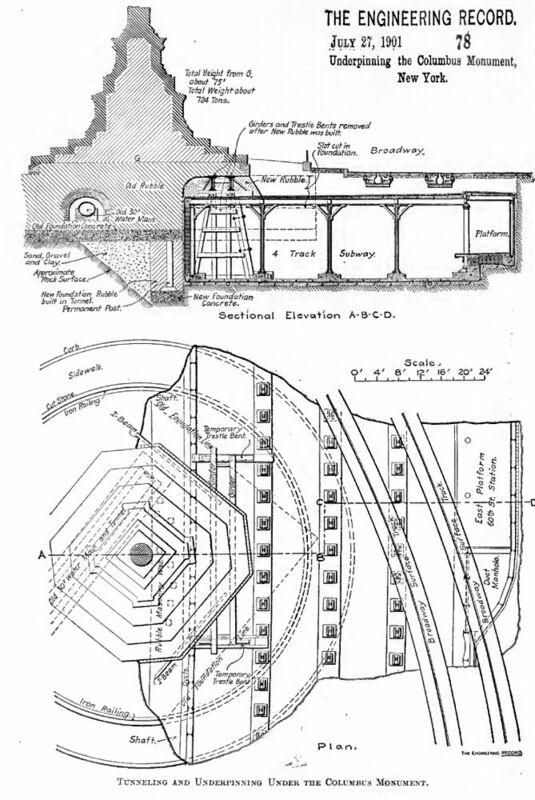 96h Street Station diagram. Rapid Transit Board report 1904. Local station with two side platforms alongside three tracks. Original IRT name tablet mosaics and "103" faience plaques are along the platform walls. The rest of the tile is new from a 1990s renovation and features tri-tone beige and brown tile and IND-style fare control grilles. There is a crossover. An emergency exit from the Lenox Avenue Line is located in the middle of the northbound platform. Local station with two side platforms alongside three tracks. There are several large original mosaic name tablets and smaller "110" cartouches along the tops of the platform walls. Each platform has separate fare controls, with no crossunder provided. There is a newsstand on the southbound platform. Local station with two side platforms alongside three tracks. A picture of the school is in the small mosaic tile border. 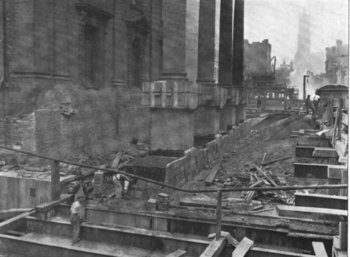 There was a central entry hall on the median of Broadway until the 1960s, at which time it was removed and replaced by the present stairways along the sidewalks. Fortunately, the station already had a crossover that could be extended out over the local tracks to the sidewalks. Local station with three tracks and two side platforms. 125th Street station is an example of the foresight of the subway's designers. Broadway at this point is in a deep valley and the transit designers had a choice of a viaduct or deep tunnel with steep grades at either end. They chose a viaduct to allow the subway to remain relatively level. The station has a mezzanine and crossunder. The mezzanine is wood with a rubberized floor covering. There is a mosaic on the stairway landings from the platforms. The stair and platform rails are ornate and thankfully have escaped the windscreen treatment. The tunnel portals are visible north and south of the station. Local station with three tracks and two side platforms. This station underwent 'modernization' in the 1970s into the present "restroom" style tilework and there are few mosaics left from the original installation. To make the walls smooth for the new tiles the old moldings and reliefs were ripped out. One relic, a ceramic cartouche of a three-faced figure, has been preserved at the New York Transit Museum. The three faces represent "Respice", "Adspice", and "Prospice", and is an emblem of nearby City College. There is a persistent local interest in restoring the station to a motif sympathetic to the original design. Some of the schist excavated from the subway in this section of the IRT was used for facing on the buildings of City College. Up to at least the late 1970s some weekday mid-day trains terminated at this station. There is a tower on the north end of the northbound platform, which is occasionally used to give some relief to the mainline tower at 240th St Yard, during general orders when this station is used as a terminal. Just north of this station is an underground lay up yard of five tracks in addition to the three tracks of the mainline. Looking south from the platforms one can see daylight from the portal at 135th Street leading to the Manhattan Valley Viaduct. Three tracks and two side platforms. The two platforms are offset and in a strange layout, due to the northbound local track merging with the center track, while the southbound platform extends further north. There are some original name tablet mosaics and numeral "145" cartouches along parts of the platforms; and some generic white tile sections of platform extensions. Two tracks and two narrow side platforms. There are mosaics similar to those at 145th Street, except the color scheme tends more to brown and green rather than blue and grey. Again, there is a mix of styles - the original cartouches are like those at 79th Street and 91st Street with the two opposing triangles, and there is also 30's style tile where the platforms were extended. The ceiling is also rather low at one end of the station. We now enter the deepest section of the IRT: the Washington Heights Mine Tunnel. This is two-track round tunnel section blasted through bedrock. The stations along this stretch, 168th Street, 181st Street, and 191st Street, all use elevators to access the fare control and the street. The three deep tunnel stations are among the grandest stations in the subway system. 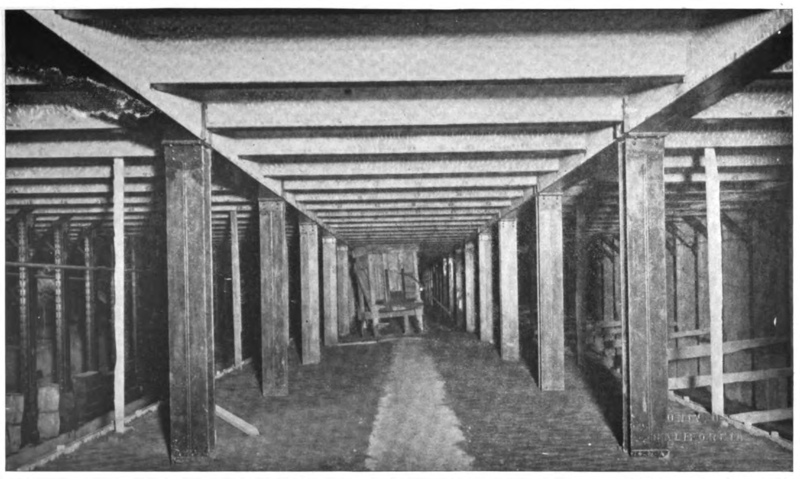 All are of round, bored tunnel construction, approximately 8 to 10 stories beneath the street. Aside from City Hall, 168th Street is probably the grandest of the original IRT stations. It features an extremely high ceiling for most of the station with the ends being regular flat ceilings. The south transition to low ceiling features marble-like accents. There are two low crossover bridges inside the tunnel arch, from which you can watch trains passing below. The crossovers are lit by low street lamp-style fixtures (mercury vapor); there mercury vapor lights along the platforms as well. The two-tone tile is unglazed brown brick on the bottom with a "dirty" tan brick on top. The typical IRT mosaics are found along the platforms. There is a closed stairway leading up from the extreme north end of the northbound platform leading to an unknown location. The original elevators were double-deckers, near the northern of the two crossover bridges. 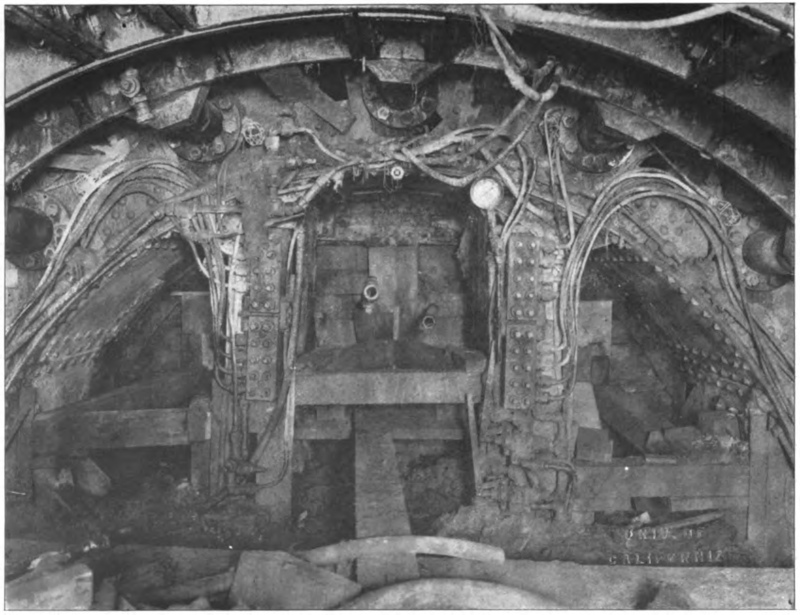 They were destroyed in the building of the IND and the space is now a vent chamber. The northern north overpass extends into the wall; look on top of the wall behind the overpass and you'll see a scissor gate leading to the elevators. The original elevator shafts are still visible, there is a window looking into the shaftway. At the rear of the shaftway is a closed-off passage leading to the theory that the original elevators had separate front and rear exits for arriving and departing passengers. The present elevators, recently modernized, are on the west side of the station and are used to access the fare control and the IND 8th Avenue Subway mezzanine. Two tracks and two side platforms. The main portion of the station is a large archway over the two tracks. Extensions at the north end are clearly evident with their heavy columns and low ceilings. There are three crossover bridges, with only the northernmost one in active use. This station has several different styles of mosaic tablets reading "181st Street-George Washington Bridge". Closed-off stairs at the south ends of the platforms lead up to an unknown location. An interesting discovery was made on the northbound platform: old two-story elevators are behind a floor-to-ceiling wooden arched gate. These manually operated elevators appear to be the very first elevators in the station. At fare control level there is a pleasant impromptu "strip mall" of subway merchants outside the fare control before the stairs to the street. Local station with two tracks and two side platforms. This station is the deepest below the street level at 180 feet down. 191st Street Station was built a few years after this section of the line opened, so its design is a bit newer and it is smaller in scale than the other stations in the deep tunnel. There are a couple of original mosaic name tablets near the platform ends. Other mosaic name tablets and a mosaic tile border along the walls and around the column tops were added around 2003. These are similar in design to other mosaics found around the system. On the southbound platform there is a room formed by corrugated metal labeled "trash room", but formerly was, believe it or not, an astronomical observatory of sorts. The instruments once in this shed were an experiment by New York University to capture cosmic rays from the stars. Cosmic rays are the nuclei of metal elements, the very atoms without the electrons, expelled at nearly light speed from certain kinds of star. Their mass and speed give them very high energy, enough to penetrate all the solid rock above the platform. The idea of building this special observatory here was to prevent the terrestrial radiation from interfering with the collection of the cosmic rays. The rock blocks most of the terrestrial signals which come from the street, letting the extra strong rays from the stars to pass through without contamination. The elevators here are outside the fare control. Looking through a peephole, evidence was seen of a passageway to old style elevators similar to those at 181st Street. Local station, two tracks and two side platforms. This is a surface station, having just exited the Fort Washington Tunnel. In fact, at the south end of the station, the platforms abut the tunnel portal, and the north end of the station is on elevated viaduct. 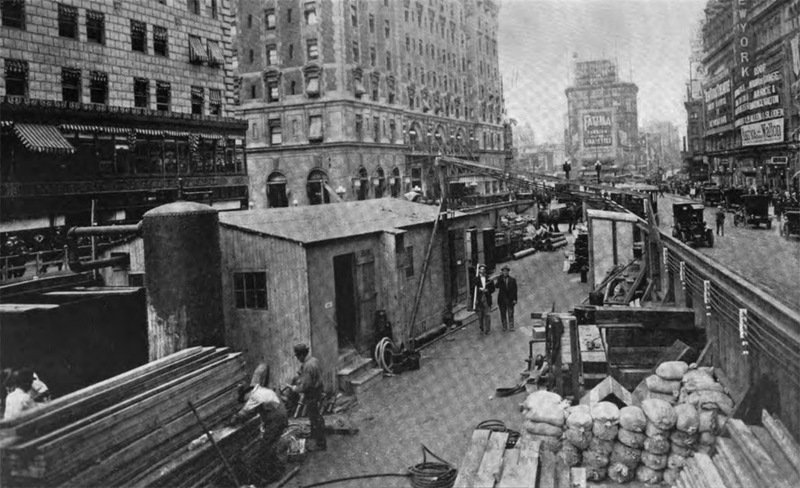 The terrain of Manhattan changes abruptly here and the subway builders went to elevated trackage to maintain a level grade. Dyckman Street is the only IRT elevated way station with only two tracks. At the south end of the station there are two "Dyckman Street" mosaics along the platforms. Old ornamental railings (without windscreens) and stairway guard rails are still present. New cast iron lighting fixtures have been installed along the platforms. The mezzanine is down quite a few stairs and has mosaic tile dove accents. For the disabled, there is an elevator from the station mezzanine to the southbound platform and an ADA compliant ramp at the station entrance. The elevator features conventional steel rope and does not need a machine room; it is the first of its type installed in the subway system. After the fare control, it is only a few steps to the street. Three tracks and two island platforms. No station house in the northbound direction. Northbound entrance is via Metrocard High Entrance/Exit Turnstiles only. No crossover or crossunder. The stations at 207th St., 215th St., 225th St. and 231st St. feature a common cast concrete artwork entitled Elevated Nature, created in 1991 by artist Wopo Holup. From here you can see the 207th Street Yard of the subway system to the eastern side. A track connection leads from the IRT elevated structure to the yard just north of the station. The shop building runs alongside the elevated structure all the way to 215th Street. Three tracks and two side platforms. This is the last stop on the island of Manhattan and has an abandoned station house on the northbound side, which is currently used by the Division of Track and Station Lighting. No station house in the northbound direction. Northbound entrance is via Metrocard High Entrance/Exit Turnstiles only. No crossover or crossunder. Local station with three tracks and two side platforms. No station house in the northbound direction. Northbound entrance is via Metrocard High Entrance/Exit Turnstiles only. No crossover or crossunder. The south end of the station is directly attached to the Broadway Bridge over the Harlem River Ship Canal. In 1960, it was determined that the existing Broadway Bridge (which opened in 1905 as part of the subway extension work), was inadequate and would have to be replaced. 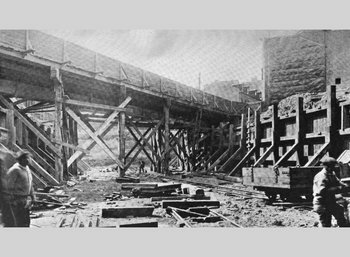 A new bridge was designed which doubled roadway capacity and added a third subway track across the river. The new bridge would have a navigable channel 304 feet wide, more than triple the width of the 1905 bridge and would have a vertical clearance of 136 feet. On December 23, 1960, train service was suspended, and the next day the old bridge was cut out and floated down river for scrapping. The new bridge had been preassembled offsite, and was floated and hoisted into position on Christmas Day. Subway trains resumed service on December 26th! However, it was months before the roadway portions were completed and four full years before the bridge was lifted for the first time. The line of the original Harlem River is preserved in the street pattern in Marble Hill just north of the station. The river flowed in an oxbow curve between 228th Street and 230th Street on the north and between Johnson Avenue and Terrace View Avenue on the west. Since the river was the original delimeter between Manhattan and the Bronx, that puts Marble Hill and the 225th St. Station politically in Manhattan. The canal was built in 1895 and the original river bed was filled in in 1914. This station replaces an original one at 230th Street and Bailey Avenue, adjacent to the New York Central's Putnam Division station. The Putnam Division terminated here; the idea was to let riders from the upper Bronx and Westchester County use the IRT to continue into the city. But, the Putnam, lacking a Manhattan terminal of its own, suffered the same fate as the New York, Westchester, and Boston Railway. It saw little business and it steadily dwindled out of existence. 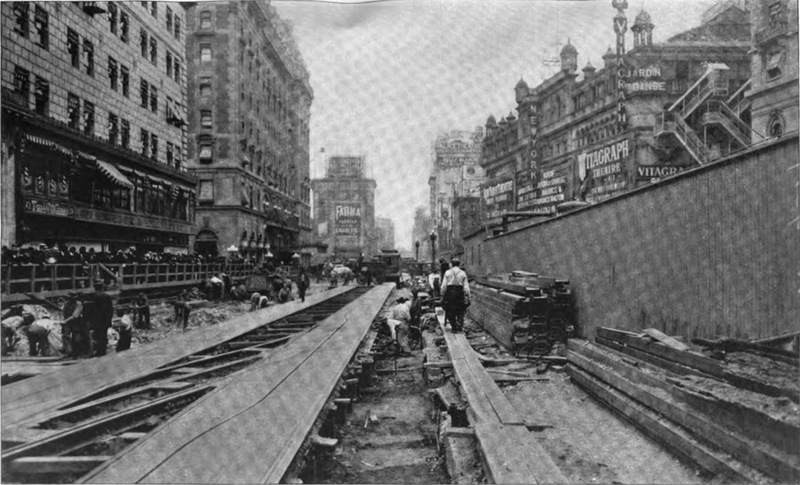 By 1907 the IRT was extended to 242nd Street and the original last stop was removed. The New York Central placed a station just to the west of the IRT's station along West 225th Street. The transfer with today's Metro-North Hudson line trains is not very convenient, but Metro-North trains can be short ended here in case of blockage farther south. Riders are discharged and sent a block or two and up long stairs to 225th Street station. Three tracks and two side platforms. Recently renovated, there is artwork installed along the walls under the canopies on the platforms. No station house in the northbound direction. Northbound entrance is via Metrocard High Entrance/Exit Turnstiles only. No crossover or crossunder. Three tracks and two side platforms. From the platforms there is a good view of the 240th Street Yard, to which there is a footbridge from the elevated structure. A whimsical touch is a covered entrance at the yard end in the form of the front end of a train, with entry from the front and not the side doors! Terminal station, two tracks with one island platform and two side platforms. The bumper blocks for the two tracks are at the north end of the station; the station house is just beyond the ends of the tracks at platform level. The two side platforms are normally unused, and have windscreen along nearly their entire length. A crew quarters straddles the tracks and platforms at the south end of the station. The layout of three and two tracks on the route from between 96th Street and 242nd Street is unusual; along the three-track stretches there are no express stations at all. No service has ever been regularly operated using the express track in this section. A journey from South Ferry to 242nd Street, local all the way, takes 49 minutes by the schedule. This station is adjacent to Van Cortlandt Park, Manhattan College, and the 240th Street Yard of the subway system. A snaking steep walk along W. 242nd Street and Manhattan College Parkway west of Broadway leads to the college and along the way you can get a panoramic view of the yard. Former trolleys of the Third Avenue Railway used to operate from street level, but these have been replaced by bus service by Bee Line Bus which operates further north into the Bronx, Yonkers, and elsewhere in Westchester County. Two tracks, one narrow island platform. This is a fairly deep station; although built first it runs east-west underneath the IND 8th Avenue/Fulton Street/Rockaway Line, which runs geographically north-south. At the east end is a long escalator, and a closed stairway with a mechanical room over the platform. Most of the station has a high ceiling. The only mosaic is a small "P" on the trackside walls. Exits are at Church Street and Broadway. 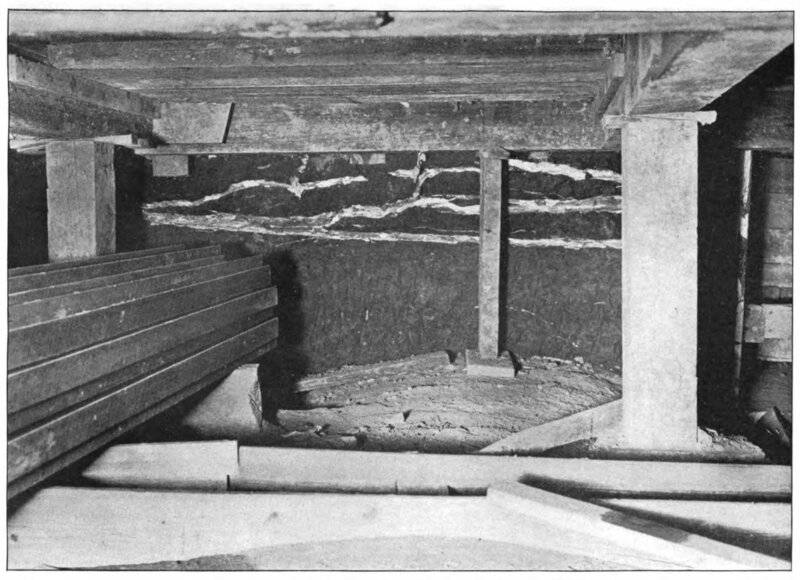 Some relative depths of stations in the World Trade Center complex are as follows, +/- 10 feet. Local station with two tracks and one island platform, under William Street from Ann Street (north) to John Street (south). The IRT West Side line from Park Place runs from there under Beekman Street and turns sharply into William Street just north of the station. The only mosaic is a small "F" along the trackside walls. The platform is very narrow with many stairways to the mezzanine. Exits are at Fulton Street, midway between Fulton and John Street, and at John Street east of William. The transfer corridor runs westerly from here under Fulton Street. The Fulton Street Transit Center is the MTA's marketing name for a new headhouse and updates to the transfer corridors at the four Fulton Street stations. Some relative depths of stations in the Fulton Street Transit Center complex are as follows, +/- 10 feet. Two tracks, one island platform. This station features brown and white signs on the I-beams. There is a full length mezzanine which features a mosaic river scene. Mosaic directional signs to Pine Street and Wall Street can be found on the mezzanine, but at platform level there are only small "W" mosaics along the trackside walls. The platform is very narrow for an island platform station, and there are several overhead fans. Exits are at Cedar Street, Wall Street, and inside 60 Wall Street's public atrium along Pine Street. 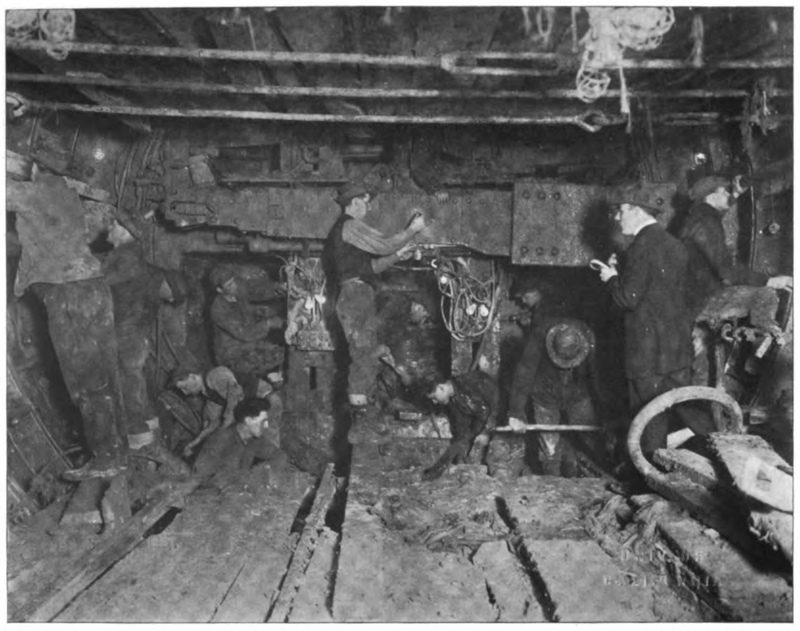 The New York Subway: Its Construction and Equipment (1904). The New York Subway Souvenir (1904). David Rogoff, "Contract I Construction", July 1962, revised July 1985, New York Division E.R.A. Bernard Linder. "IRT Broadway-7th Avenue Line Opening Dates and Schedule Changes," December 1990, New York Division E.R.A. By David Pirmann and Peggy Darlington.